Output beats contact, unless the nature of the work is 'social' (in the sense of being collaborative, rather than in the sense of Facebook). But if effective homeworking equates to effective measurement, why do so many businesses struggle with it? Quite simply: Most of us aren’t running a factory, we’re running a studio. Factories measure output. Work is easily identified and quantified. It is also self-contained, making it easier to measure individual impact. Yes, there are production line dependencies, but you can spot the robot that crashed. Knowledge-lead businesses are more like a studio. Output is harder to quantify, except at the end of the sales process. You only truly know what a painting is worth at the moment it is sold. It is also much harder to identify each person’s contribution. What of the person who cleaned the brushes, created the set or fetched the paint? The completion of products is infrequent and sporadic. A product manager or designer might launch four products a year. That doesn’t give many measurement points. It is very hard to measure progress on a weekly, let alone a daily basis. And whose work was it anyway? Output is a collaborative effort. But these problems - management and measurement- may also be the solution, when classified as motivation and alignment. The biggest challenge in a distributed environment, like a homeworking one, is alignment. It’s the critical difference between efficiency and effectiveness. Which of these is better: One person achieving one thing that moves the business towards a strategic objective, or 100 people, each doing ten things towards five irrelevant goals? ‘Anti-work is’ corrosive to a businesses, and yet in survey after survey, I find workers either don’t know what the goals of their business are, or are working towards an outdated definition of them. Clearly set and communicated goals allow people to work interdependently, interpendently and flexibly. Goals need to be broken down into meaningful steps (we call these Milestones), so there is an objective way to establish if things are going awry. If people know where they are going, they will get there – provided they are motivated. The most fundamental failure of business managers is a failure to create belief. You can plan a ship’s journey, but if the crew doesn’t buy it, there’s a mutiny ahead. And that’s the best outcome. There is a myth that having employees in the office will fix motivation. It might do in a factory, although that's debatable, but it definitely doesn’t in the studio. 'Presenteeism' is far more dangerous in an office. One dissatisfied employee can demotivate and entire team, if not an entire organisation. Remote working (actually, all working) is founded on trust. And trust comes out of relationships. People need to meet face to face, from time to time. The creative energy of the (physical) conversation is a powerful binding force. 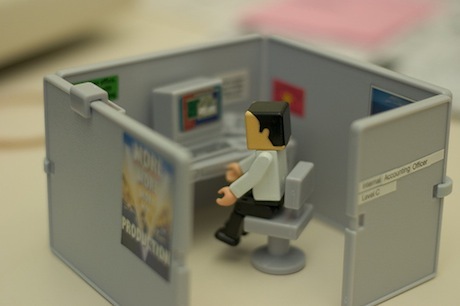 Seeing photos and personal clutter at a colleague’s desk all help to create character. When workers are de-humanised into stereotypes, disenchantment follows. People, from the management team to the latest hire, need to be real and connected. Physical co-location can help with that, but it isn’t always the answer. It depends on the type of work, and the type of working. It’s easy to convolute “homeworking” and “teleworking” but it assumes there are two types of remote working: one where the home is the permanent place of work, the other where the business office is the main location, but work can happen at other locations. It is probably Paul Graham who popularised the different types of time slicing in business for managers and makers. I alternate between managing, consulting and coding. When I’m managing, I’m operating in very small slices of time. Interruptions are frequent, and part of the flow. Decisions are made in minutes, if not seconds, and then I move on. When I’m consulting, I am at the mercy of other people’s diaries. I’m working in hourly chunks, the rhythm of meetings (or billing). When I’m coding, I’m lost in thought. A two-minute interruption can set me back hours. When the phone goes off, it’s like a parent coming into the bedroom with a hoover and an anger management problem. Boom. Start again. It’s probably no surprise that different types of work suit different types of environment. Note that I say “work”, not “role” - There is a time and a place for homeworking in almost every role. It’s not about location, it’s about availability. Having Skype and Milestone Planner makes it easy for me to prioritise and connect with the team. When I’m consulting, the diary is king, Skype is off, and the phone is on silent. I am as happy in an office meeting room as I am in a coffee shop. When I’m coding, I usually want to be at home, with the phone off and messaging shutdown. I often end up coding at night; there’s something about the early hours that makes me especially productive. There is much about my role that is unique (as is yours), but the fact remains that the choice of location isn’t a binary one. I know people who are glad to get into the office but there are many whose creativity is sacrificed in an open-plan building. My businesses are built upon workforce flexibility. I strongly believe that will enable us to attract and retain talent who are inaccessible to some of our would-be competitors. Sometimes people need to be at home to take a delivery, deal with a child-care issue, or just to concentrate. And if they have a cold, quarantine is a blessing. Be flexible about where people work and you create a more flexible, better designed business. It gives the ability to attract unique talent, and keep people engaged in the business. Oh, and you’ll probably fix your disaster recovery challenges at the same time. It’s not about when or where people work, it’s about what they get done.